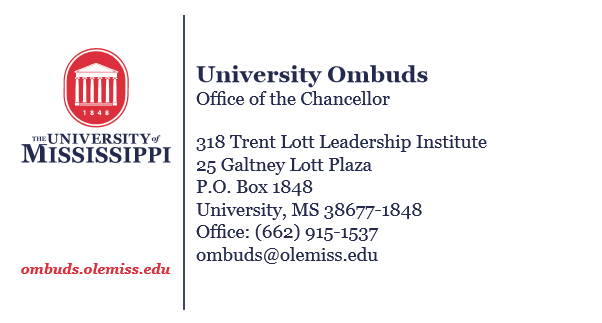 If you would like to schedule an appointment to discuss an issue or concern, or if you just want to learn more about the services provided by the University Ombuds’ Office, please call our office at (662) 915-1537. In order to protect your confidentiality, please do not leave any confidential information in voicemail. Prior arrangements can be made for appointments outside of our usual office hours. We understand that your workplace may not be located on the Oxford Campus or that you may not have the freedom to leave your work location during working hours. Give us a call and we will find a time to meet with you. The Office of the Ombudsperson is located on the third floor of the Trent Lott Leadership Institute (LaBauve Hall), in Room 318, on the Main Campus, in Oxford. Although we welcome drop-in appointments, because we may not be available when you stop by, and to protect your own confidentiality and the confidentiality of others who come to the Office, we recommend that visitors make an appointment to meet with the University Ombudsperson. For those who are at one of the University of Mississippi satellite campuses – UM-Tupelo, UM-Desoto, Grenada Center, or Booneville Center – or for those who have a concern about meeting at Office of the Ombudsperson, alternative locations for an appointment may be made. If you choose to e-mail the Office of the Ombudsperson or the University Ombudsperson, please do so with the understanding that e-mail is NOT considered to be a confidential method of communication. If you choose to contact the University Ombudsperson through e-mail, please limit communications to scheduling appointments and refrain from providing other details about your inquiry or concern. When involved in a dispute or facing a workplace issue, it is understandable to want to meet with the University Ombudsperson immediately. In order to protect the privacy of all visitors to the office, calling ahead is always recommended. Most of the time, same-day appointments are available. Drop-ins will be accommodated whenever possible. All communication with the University Ombudsperson and the Office of the Ombudsperson is informal and “off the record.” Neither the University Ombudsperson nor the Office of the Ombudsperson act as an agent of “notice” for the University. Neither the University Ombudsperson nor the Office of the Ombudsperson accept notice on behalf of the University of Mississippi. Consulting with the University Ombudsperson will not initiate any formal complaint process; however, members of the University of Mississippi Community are welcome to meet with the University Ombudsperson to discuss where and how to file a formal grievance or how to put the University on notice. In the alternative, members of the University of Mississippi Community are welcome to contact the Office of Equal Opportunity and Regulatory Compliance (662) 915-7735, the Title IX Office, Telephone (662) 915-7045, TDD:(662) 915-1570, or the Office of General Counsel located at 209 Lyceum, Telephone (662) 915-7014, Fax 662-915-5640 in order to provide the University with formal notice of an issue.